The story of a motorcycle trip from Minnesota to the Pacific Northwest, the narrator (who turns out to be the author- but we don't know that initially) is travelling with his son, Chris and a couple of friends of theirs, John and Sylvia initially. As they travel along, the narrator interweaves the story of their journey with what he calls 'Chautauquas' delving into various aspects of philosophy which gradually reveal a past self of the narrator, whom he refers to as Phaedrus. Phaedrus taught creative and technical writing at a small college and became engrossed with the ideas of what makes good writing or 'quality' which he talks about a lot but doesn't actually get around to defining. There's a sense of foreboding when the narrator is talking about Phaedrus- the reasons for which are unclear at first, until gradually we find out that Phaedrus went down the rabbit hole of his quest for 'quality' and how to define it which eventually drove him insane. He was subjected to electroconvulsive therapy which changed his personality to that of the narrator's. The narrative portion of the book works quite well. There's a real sense of foreboding about Phaedrus which only grows as the narrator begins to realize that Phaedrus is starting to re-emerge and begins to despair as he feels like his sanity is slipping away once more. The relationship between father and son grows progressively more strained in parts- since the narrator worries that his son is beginning to show signs of the same mental illness he struggled with. How Phaedrus re-emerges and reconciles with the narrator's personality is handled beautifully by shifting use of fonts. The narrator's point of view is shown in one kind of font and Phaedrus' in another. Now that's some #DeepShit I can get behind, because he's absolutely right- we can't expect to truly change our government ever until we change ourselves. Gives new impetus to the whole, 'be the change you wish to see in the world' quote, doesn't it? This. This quote resonated with me as well. And that's pretty much how the whole philosophy portion of the book went. Certain things jumped out at me from time to time- Pirsig thinks a return to self-reliance is important- not because of the traditional calls for that return- namely, ideological calls to benefit the rich- in his words- but because self-reliance will make for happier individuals- it will help people to find quality. This was not at all what I was expecting. 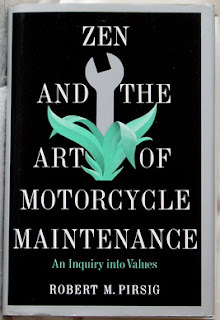 Neither zen nor motorcycles play a large role in the book and philosophy tends to give me a headache- especially on the level that Pirsig is playing on. I haven't read Aristotle or Plate. I couldn't tell you the difference between a Sophist and a whatever the opposite of a Sophist is- perhaps a Stoic? 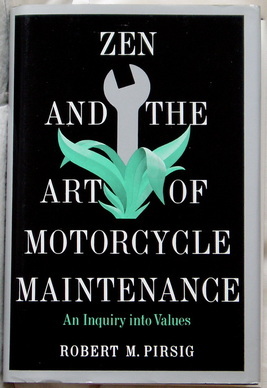 All credit to Pirsig: when he says this is an inquiry into values, he is not messing around. Overall: An interesting book... it aims for the old American tradition embodied by folks like Thoreau and probably hits the mark, but to be honest, unless you have both a love of philosophy and some background in it, you're probably not going to get much from this book- other than a headache that is. I also wasn't crazy about the way Pirsig approached the mental illness described in this book. It was Phaedrus' quest for 'quality' that drove him insane. I'm not sure if that's more metaphor than fact- but if it's latter instead of the former that's... uncomfortable. It's going to be a relief to return this bad boy to the library. My Grade: ** out of ****.